Are you busy? 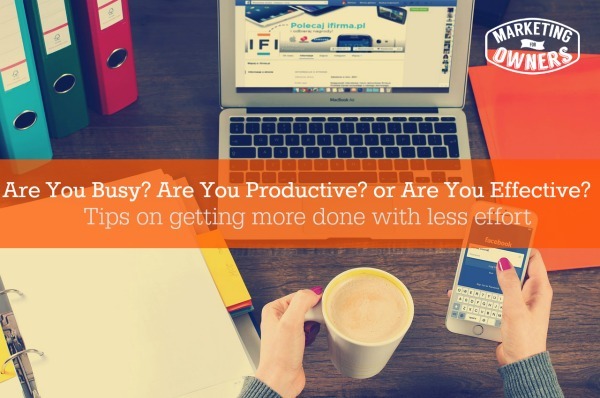 Are you productive or are you effective? These sound like confusing terms don’t they? Let me explain. What I am about to share with you is my opinion on being busy, productive or effective. There are three states in my opinion — busy, productive, and effective. Let’s start with being busy. A lot of people are busy running around. They look like chickens with their heads cut off. They are running from here to there, starting endless projects and while they look like they have it all together, they are really helping no one. Being productive is a step up from being busy. There is the term out there about being a busy fool, which means the work is not happening as well as you want it to. Productivity is still being busy, BUT that busy work is worthwhile. It means you are doing something — it is producing. Now being productive is not everything. It means you produce a lot. In Europe, they used to have a thing called The Wine Lake and The Butter Mountain. This is where farmers over-produce (being very productive) making more product than can be consumed. You can see how being productive can sometimes cause you to create too much instead of just enough. The answer that I think we all need to look for is instead of being busy or productive, I would prefer to be effective. Effective is a step up from productive. So yes you are productive but you are also effective. It means, that you have an effect. If you set goals, then you have an aim to reach. Those aims help to further your life, your business, you health, your wealth– every area. In this context we are talking about your business if you are effective, you are going to achieve those goals. If you cross off those goals, you are having an effect. Goal setting is very very important. You will not get far if you don’t have aims and goals and a plan. If you achieve those aims and goals, and follow your path or your plan you will be effective and you are on the right path. Today I want to tell you about an organization in New York called She’s The First. 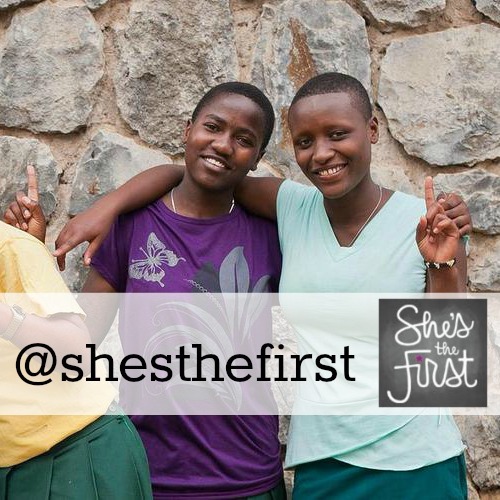 Now, this organization sponsors further education for girls, girls from low income countries. It’s an admirable charity. I like what they do. We forget. We see everything going on in our own country and we forget that in other places in the world they don’t even have water to drink. I think I’ve heard that are somewhere around seven billion people who do not have access to fresh water. A lot of people, especially girls, do not have access to adequate education. Some of us can do things about that like She’s the First and they are doing a good job. The reason I’m recommending following their Twitter handle and seeing what they do, is not for what they do but I like the way they promote. Now, they are not all-out-promotion but what they do,is this — they tend to promote the people that support them. They will show where somebody from the organization is being given an award or someone who has promoted or given them some recent support is being featured somewhere else. Now why this is a great thing to copy or do for your own business is because those people are then going to re-tweet that they were mentioned in the tweet. So what they are doing is they are leveraging on leveraging the other people’s following. That’s the whole point of these friendly follows. How can you learn from their success? I’m sure you can. What can you do to be more effective?